In 1855, three German immigrant women responded to the call of St. John Neumann, Bishop of Philadelphia, and founded our congregation, The Sisters of St. Francis of the Neumann Communities. From that time until this day, we have ministered to the immigrant population — from providing safe housing to young women immigrants, to founding hospitals that accepted and served immigrants, to teaching immigrant children. We continue to provide shelter and instruction to those people needing our help. 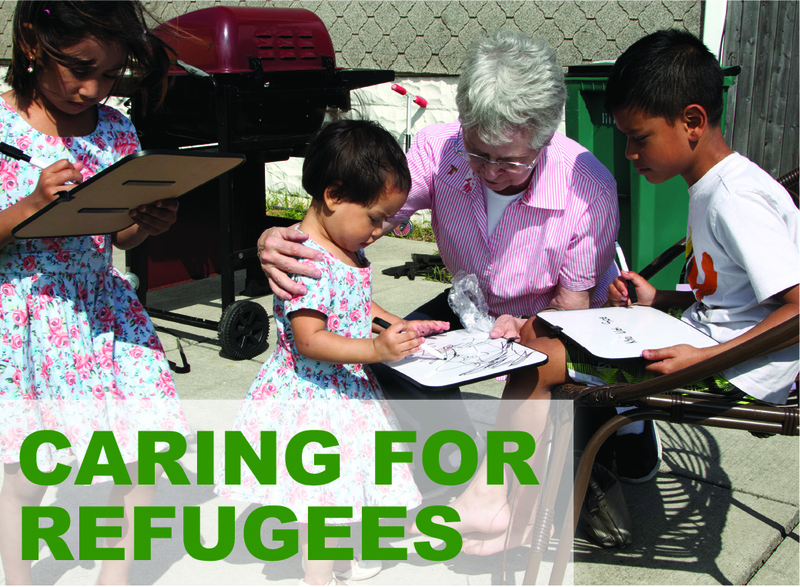 We morally commit ourselves to support those who need to leave their country of origin and resettle in the U.S. In spite of the struggle to politicize the issue of immigration, we remain steadfast and active in serving those who find themselves in need. Sister Pat Bergan believes non-violent protesting and civil disobedience are still the best ways to bring about change in the world today. She should know. She’s spent the past 30 years of her life fighting for justice for people who are poor, unwelcomed and for an environment in need of care. In recognition of Sister Pat Bergan’s lifelong commitment to activism, the ArtRage Gallery in Syracuse, New York is featuring her in a photography exhibit entitled “Still the One.” The goal of the exhibition, which honors 27 women activists age 80 and older from central New York, is to share the wisdom of these elders and recognize those who persisted and made a difference. The exhibit runs through January 13, 2018. She says the media’s extensive coverage of pro-immigration demonstrations gets the protesters’ messages out to more people. “Protests today are very valuable because the media focuses in on them,” she says. Patience Ohanma gives compassionate care to Sister Francis Marie Vallone at St. Mary of the Angels in Williamsville, New York. At St. Mary of the Angels, it is Patience’s job to assist the sisters who live in the healthcare unit at the western New York region house of the Sisters of St. Francis of the Neumann Communities. She helps them do the little things that they may have difficulty doing on their own — dressing, bathing or eating. It is work that she does with great joy. “They are all so sweet. I love them all so much,” she says of the sisters. Her work has given her a goal for her future. “I want to help take care of people, especially the older ones. And what I see at the convent has really encouraged me to want to do more of this kind of work,” she says. So as soon as she possibly could, Patience began studying for certification as a licensed practical nurse. The part-time job with the sisters also has made it possible for her to provide a life for her family. Patience’s life today is a far cry from what it was three years ago. Then she lived in her native Nigeria with an abusive husband, a government official who regularly beat her and who left their daughter unable to walk. When her several attempts to divorce him were denied by the country’s Registry of Divorce, Patience fled with her 14-year old daughter and 16-year old son. 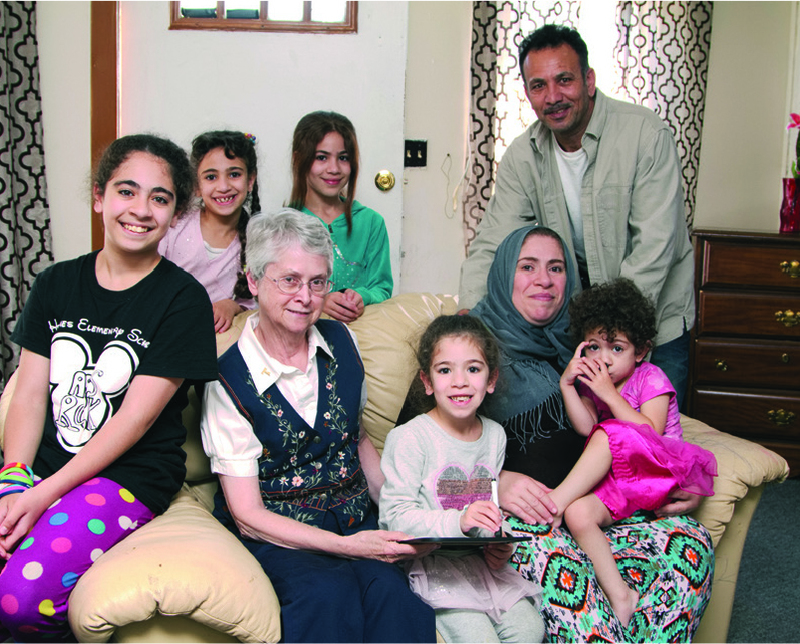 Her plan was to settle in Canada with her sister-in-law, but that relationship didn’t meet the Canadian legal requirements for immigrants, so she ended up across the border in Buffalo, New York, living at Vive, a center for refugees and asylum seekers that the Sisters of St. Francis helped to establish. Patience met Sister Beth Niederpruem, a social worker. “She was someone I could share all my pain with and make me feel better about everything that had happened,” Patience says. Sister Beth and the Vive staff helped Patience fill out and file the paperwork needed to establish asylum status in the U.S. They helped her enroll her son in school and arranged for the surgery her daughter needed to repair her hip and ankle that had been damaged when her father pushed her down the stairs. It was during her daughter’s recovery that Sister Beth noticed how well Patience provided care and suggested that she might be able to do the same for the sisters in the healthcare unit at St. Mary of the Angels. After an 18 month stay at Vive, Patience and her children live in an apartment. Her son is 18 now and her daughter is in high school, “winning awards and is on the honor roll,” Patience reports. She gives glory to God for having set her on a path that put her in touch with the sisters and toward a new life. “The sisters are so happy when I come to see them. And I am so grateful to be with them,” Patience says. To give back to those who gave him hope, Cecil helped out with renovation projects at Vive. I had always hoped to visit America, but it came sooner than I expected,” says Cecil. His stay in the U.S. is likely much longer than he would have planned as well. Cecil now lives in western New York and, with the help of the Sisters of St. Francis of the Neumann Communities and Vive, he is seeking asylum status. Vive offers housing, food and legal assistance to individuals seeking asylum from persecution in their home countries. Our sisters and several other orders of women religious opened Vive in a Buffalo, New York convent in 1984 to help refugees who were fleeing civil wars in Central and South America. Now housed in a former school building, Vive has helped more than 100,000 men, women and children seek asylum in the U.S. and Canada. Cecil’s journey to Buffalo began in his native Zimbabwe, where all he wanted to do was bring hope to the poor. He loaned the money he earned as an electrical engineer to young people starting businesses. When they paid their loans, Cecil used the money to fund the next project. “I wanted to improve the lives of the people, create some employment, create some self-reliant system,” Cecil says. What happened instead is that government officials labeled Cecil an anti-government activist; government agents followed his every move and he was illegally imprisoned and tortured. When it became obvious that his life was in danger, Cecil fled the country. He landed in New York City; he had nothing and knew no one. “One of the nice people from the Immigration Office told me, ‘there is a place, called Vive, but it’s not close by,’” Cecil recalls. “’It’s on the other side of the state.’” So he took his little bag and his documents and headed for Buffalo. When he finally arrived at Vive, Cecil was in pain, his clothes sticky with blood from his last round of torture. He says he was given a warm welcome, treatment for his wounds and clean clothing. “The attention I got from the people who were on duty was really quite amazing. From there, my life changed,” Cecil says. His physical needs met and paperwork for his refugee status underway, the reality of his situation hit Cecil. “I had undergone the shock of my system. I tried to adjust but it wasn’t easy,” he says. Sister Beth Niederpruem is a social worker at Vive, where part of her responsibilities are to help residents adjust to their new surroundings and deal with the trauma of their pasts. Many have been tortured, like Cecil, Sister Beth notes, while others have experienced sexual assault or seen family members attacked. They deal with survivor’s guilt, says Sister Beth, or the guilt of having left behind loved ones. She spends time counseling them or arranges treatment by psychologists and psychiatrists when necessary. To Cecil, the sisters gave him more than hope. “It’s quite amazing and quite disturbing when you are in trouble and you become homeless at the same time. The problems become overwhelming. At some point, you stop thinking. You cease to exist mentally. You become like a block. I was in that situation,” he says. “With the help of the sisters, they managed to mold me back into a certain shell, to bring back my sanity,” he says. I teach English to adult refugees through the Buffalo School District Adult Education Department. All the students at my location are Catholic Charities clients. Many of the clients have never had any education in their country and cannot read or write in their language. My goal is to help the refugees become employable by learning the English language. Students who advance have the opportunity to get their GED and go on to accessing higher education and skilled or vocational training. 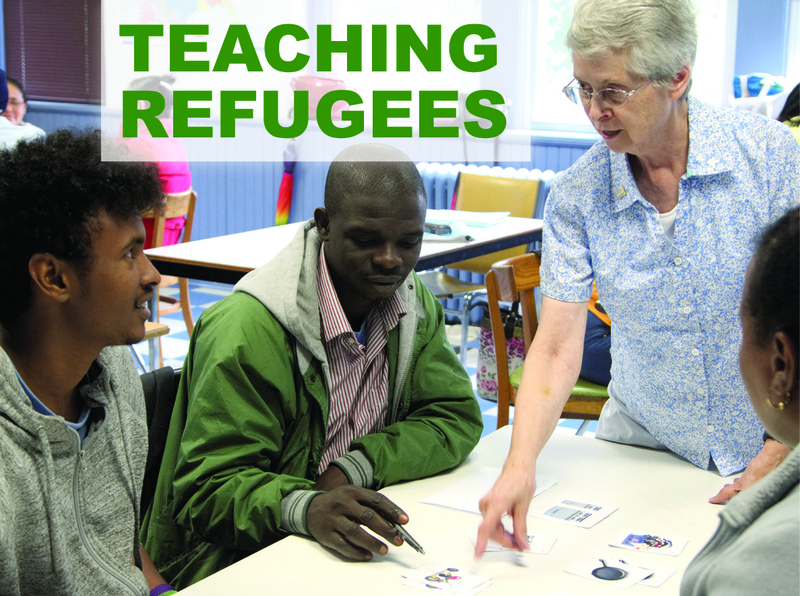 Teaching the refugees is challenging and rewarding. They are highly motivated and appreciate the education I offer them. My students are happy, grateful, enthusiastic and determined people who want to adapt to our culture and become self-sufficient and productive individuals. I met Sanlin Tha in 2010 when he was a student in my English as a Second Language (ESL) class in Buffalo, New York. A native of Burma, he is married and the father of three. Sanlin is a very energetic and determined man who has since secured a full-time job and bought a small house for his family on Buffalo’s west side. His wife, A Phyu left Burma with their first child in 2008, but as the van of refugees attempted to cross the border, her son was shot and killed. They were blessed with another son, Khai Wati Soe while they were living in Malaysia. A refugee from Iraq, Mohamed Aly is the father of five daughters. I met him in 2013 when he was a student in my class. He and his wife had to leave Iraq; they resettled in Syria but when the war broke out there, they were able to move with the family to Buffalo. One of their daughters needed serious medical attention. Thanks to a grant from our congregation’s Mill Street Ministry Fund, we were able to help the family get the care they needed. 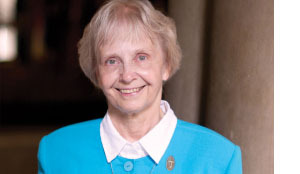 For most of her religious life, Sister Suzanne Susany has ministered with Hispanics in Puerto Rico, Ohio, Georgia and presently in Pittsburgh, Pa. “I wanted to work with the immigrants,” she says, “all immigrants, documented and undocumented.” She carried out this call to ministry as she served in parishes, responding to a variety of needs. In 2010, Sister Suzanne strengthened her ability to help when she earned a law degree from Duquesne University School of Law in Pittsburgh. “I saw good moral people with families being picked up and put in jail and I wanted to help,” she says. She shares an incident experienced by a family traveling with their son and daughter. When they stopped for gas, the son told the father that a policeman was watching him. When he continued driving and went through a green light he was pulled over. The son and daughter were accused of having fraudulent documents and incarcerated. The indignity was that the daughter couldn’t speak the language and she spent a month in jail. The criminal charges were later dismissed but both were then placed in deportation. In another instance, a father, mother and a one-year-old child were awakened at 6 a.m. by the Immigration Customs Enforcement (ICE) knocking on their door. Although ICE officers were looking for the father’s brother, ICE took the father to be fingerprinted. Though the father was not the person for whom they were looking, ICE officials placed him in removal proceedings. He was only seven weeks away from being in the states for 10 years which would have allowed him the opportunity to try for cancellation of removal under the law. Often the use of the terms immigrant and refugee are used interchangeably. The following definitions give a clear distinction between the two. An immigrant is a person who has citizenship in one country but who enters a different country to set up a permanent residence. In order to be an immigrant you must have citizenship in one country, and you must have gone to a different country with the specific intention of living there. Refugee status is a form of protection that may be granted to people who have been persecuted or fear they will be persecuted in their own country by the government or a group the government cannot control because of race, religion, nationality, gender, and/or membership in a particular social group or political opinion, and who have fled for safety to another country and are awaiting settlement through the United Nations. Briefly, asylum is a form of protection that may be granted to people who have been persecuted or fear they will be persecuted by a government agency or an agency that the government cannot control in their own country on account of their race, religion, nationality, gender, and/or membership in a particular social group or political opinion, and who have entered the United States requesting that protection.